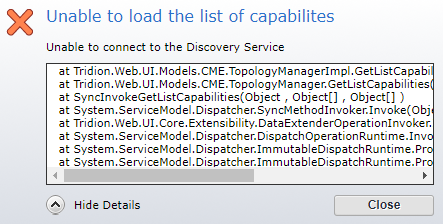 I am getting an error in the notification panel saying Unable to load the list of capabilites when I click on the Live Environment Id in the Topology Management. When I checked all the functioanlity is working fine. The publishing works perfectly in Live. Also the Discovery registration tool is fetching all the roles in the command window. Also, the Staging Environment Id is not throwing such error. The only change between staging and Live environment is that Live discovery service has been mapped with two deployers using Mirror Strategy. I am not able to find any log related to this neither in Event Viewer nor in content delivery Logs. Also, I checked the SDL Logs (..\SDL Web\log) for topology but nothing logged over there. Please help. This seems to be a problem with the Discovery Service client used by the CME. Please report this to SDL Customer Support. This isn't an answer but more information on this problem. "StackTrace":"   at Tridion.Web.UI.Models.CME.TopologyManagerImpl.GetListCapabilities(String cdEnvironmentId)\u000d\u000a   at Tridion.Web.UI.Models.CME.TopologyManager.GetListCapabilities(String cdEnvironmentId)\u000d\u000a   at SyncInvokeGetListCapabilities(Object , Object , Object )\u000d\u000a   at System.ServiceModel.Dispatcher.SyncMethodInvoker.Invoke(Object instance, Object inputs, Object& outputs)\u000d\u000a   at Tridion.Web.UI.Core.Extensibility.DataExtenderOperationInvoker.Invoke(Object instance, Object inputs, Object& outputs)\u000d\u000a   at System.ServiceModel.Dispatcher.DispatchOperationRuntime.InvokeBegin(MessageRpc& rpc)\u000d\u000a   at System.ServiceModel.Dispatcher.ImmutableDispatchRuntime.ProcessMessage5(MessageRpc& rpc)\u000d\u000a   at System.ServiceModel.Dispatcher.ImmutableDispatchRuntime.ProcessMessage11(MessageRpc& rpc)\u000d\u000a   at System.ServiceModel.Dispatcher.MessageRpc.Process(Boolean isOperationContextSet)"
The discovery service url can be opened from the server that hosts the CM (so it doesn't seem to be a problem with closed ports or wrong ip addresses/hostnames. UPDATE It does seem to have something to do with the deployer that's set as "MIRRORED". We removed all capabilities (except for token capability) and than the list did display correctly. We added some more capabilities one by one, and from the moment we added the deployer capability, the error reappeared. Could this be a bug in the topology manager client ? Or is there something wrong with the way we configured the mirroring deployers ? Encountered the same error behavior in the Topology Managent UI in 8.5. This error seems to have no impact on functionality other than not displaying the available capabilities for the selected CD Environment in the UI. Transporting publish packages to the configured deployers works as expected and deployment is handled correctly by each of them. The publish transaction reports correctly the publishing process details for each deployer. The UI error occurs when the DeployerCapability role's Strategy attribute is set to MIRROR. The client simply cannot deserialize the message because the type Tridion.WebDelivery.Platform.DestinationURL does not exist in the generated OData client proxy. Not the answer you're looking for? Browse other questions tagged content-delivery web8.5 topology-manager deployerservice or ask your own question.